We offer training through trained faculties & instructors for embroidery and related skilled works in our campus and conduct workshops outside as well. With our Centralized Training Center students can learn Computer embroidery machine & its operation and also about digitizing designs. Our comprehensive Embroidery Training Program is a successful approach to learn the art of embroidery and Start Your Own Boutique. We offer training for embroidery and related skilled works in our campus and conduct workshops outside as well. Training are imparted through trained faculties & Instructors at affordable course fees To Start Your Own Boutique. 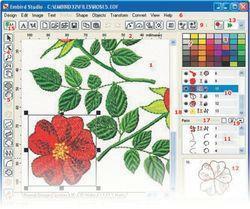 Great topics such as Using the Machine, Framing cloth, Creating a Template, Transferring designs from Computer to machine etc will enable you to create impressive embroidery which include in this module. We have a Big computer lab's with sitting capacity of 20 students at one time so that students get hands on practicals through individual machines & Computers. During the training session Students can use all the great software techniques they learned and create embroidery products by applying them to real world decorating challenges of the fashion shows.